This pretty little church is as remote from its village as it is from the rest of the world. 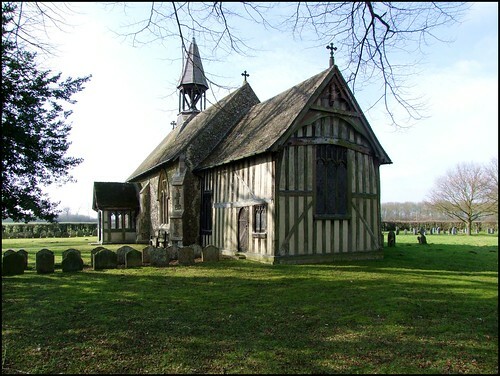 What is more, it has the only timber-framed chancel in Suffolk. You get to it along a path from the lonely road between Coddenham and Stonham Aspal. The village is a good mile away, along the old Roman road. Beside the church is the site of the former manor house, and the path to the church runs along the edge of the old moat. You approach the church from the east, through a little gate. What a lovely sight it is! The external east wall is delightful, like a fairy-tale cottage. The 15th century porch is contemporary with it, but the nave is all Victorian, by local architect Edward Hakewill, which may fill those of us who have met him before with a sense of foreboding. There was never a tower, and in fact this church was a chapel of ease to Coddenham until the 20th century. For many years, All Saints was kept locked without a keyholder, but now it is open every weekend, with a keyholder notice for other times. The exterior might lead you to expect a humble, rustic interior, but in fact this pretty little building contains something quite different, for inside is one of Hakewill's best restorations in Suffolk. We get used to Hakewill's dark, gloomy interiors - Shottisham, for example, or Rushmere before George Pace came along. Here, the structure of the building prevented him adding his favoured low north aisle, and instead we have an opulence which is powerful on such a small scale. It is still dark inside, but the low sun through small windows picks out rich woodwork and jewel-like glass. High in the west wall is that rare thing, a glass set of royal arms, this one for Victoria and contemporary with Hakewill's work. The east window has three small scenes depicting the Resurrection flanked by the raising of Lazarus and the raising of Jairus's daughter. The two outer scenes appear again on the reredos at neighbouring Gosbeck, flanking the Crucifixion. Otherwise, the glass is all decorative, and set as it is among the dark wood you get the feeling of the hall of a large country house: you almost expect to hear a grandfather clock ticking, as at Mickfield across the fields. I wondered if John Betjeman ever visited Crowfield: I am sure that he would have loved it. The carved bench and stall ends are of excellent quality. Sam Mortlock credits them to James Wormald and William Polly: Polly had also worked with Hakewill at Rushmere St Andrew. The restoration was bankrolled by the widow of Sir William Fowle Fowle Middleton of Shrubland Hall. Her husband is remembered on the north wall by his late tenantry, for his high integrity and worth, and it records their high esteem for one who ever promoted their best interests and welfare. The inscription continues in the grand classical manner of a century earlier. He seems to have been a good bloke. His medallion portrait in profile above renders him noble, as if he had been a Roman senator who retired to the country, and died there, among the grateful peasants whose lives he had chosen to transform. Shrubland Hall later became a self-styled 'spa health farm', but today is closed, and will no doubt now be converted into apartments, as is the way with such things.